These size 4 Peppa Pig Pyjamas are 100% Cotton. Great for fans of Peppa Pig, this two piece Peppa Pig pyjama set has pink elastic waisted long pants, with a matching white top featuring featuring a cute Peppa Pig Print. 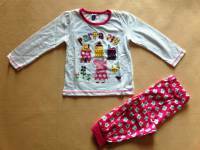 These Peppa Pig Pyjamas are also available in Size 2, Size 3, Size 5, and Size 6.